A first of its kind, 50-state report reveals that state governments are losing out on over $10 billion in transportation revenue every year, contributing to an estimated $130 billion drain on the economy resulting from higher vehicle repair costs and travel time delays. 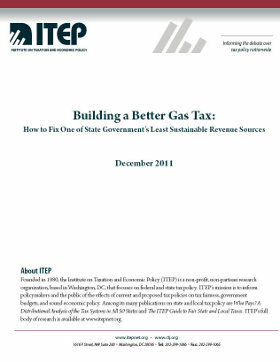 The report, Building a Better Gas Tax: How to Fix One of State Government’s Least Sustainable Revenue Sources shows that the average state has not increased its gas tax rate in over a decade, and fourteen states have gone twenty years or longer without an increase. As the cost of paving roads and building bridges rises, the tax that’s designed to pay for them keeps shrinking. Adjusting for construction cost growth, the average state’s gasoline tax rate has effectively fallen by 20 percent, or 6.8 cents per gallon, since the last time it was raised. Diesel taxes have fallen by a similar 18 percent, or 6.0 cents per gallon. 1. Increase gas tax rates to (at least) reverse their long term declines. the impact of gas tax reform.